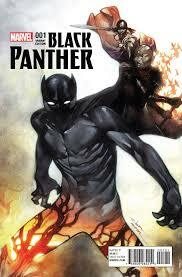 What caught my attention when I saw Olivier Coipel's variant of Black Panther #1 was the cape. Most of the artists for the variants and Brian Stelfreeze in the comic book had removed the cape. But here it was in Coipel's image for the cover. Of course, the attire makes it possible for the artist to stretch out in creative ways in this case. Along the cape, we see other characters, which are likely the Dora Milaje--the bodyguards, at least historically, for Black Panther/T'Challa. Coipel draws the legs of Black Panther's suit encased in what appears to be fire. Fire also trails the women on the cape.